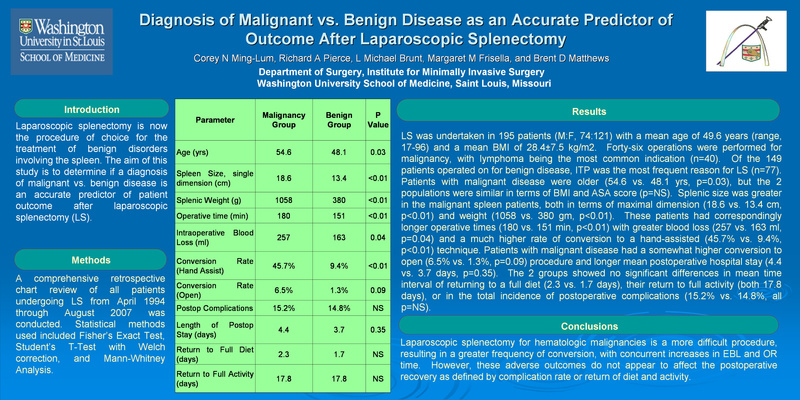 Introduction: The aim of this study is to determine if a diagnosis of malignant vs. benign disease is an accurate predictor of patient outcome after laparoscopic splenectomy (LS). Methods: A comprehensive retrospective chart review of all patients undergoing LS from April 1994 through August 2007 was conducted. Statistical methods used included Fisher’s Exact Test, Student’s T-Test with Welch correction, and Mann-Whitney Analysis.